The time machine in "Dr. Who" is called the TARDIS, which stands for Time and Relative Dimensions in Space. Whether you prefer phone booths, cars or wearable devices, surely there is a time machine out there for you. We've gathered some of the top time machines from science fiction, in all their wibbily wobbly timey wimey glory. 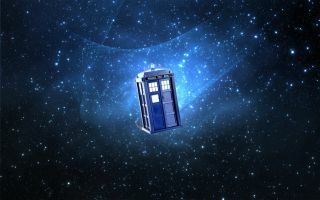 Perhaps the most famous of time machines, the TARDIS (Time And Relative Dimension In Space), which is disguised as a police phone booth, allows Doctor Who and his companions to jump across eras on planet Earth. Michael J. Fox (right) and Christopher Lloyd appear in "Back to the Future." In the "Back to the Future" trilogy, the DeLorean can travel to a time you punch into the car's dashboard as long as the vehicle reaches 88 miles per hour and has sufficient power. This leads to several complications for the characters, however, when they run out of the plutonium that is usually used to power the vehicle. Much of the first movie revolves around finding an alternative source of power. Promtional image of "Star Trek IV: The Voyage Home." While the characters in "Star Trek: The Original Series" are no stranger to time travel, it is in the film "Star Trek IV: The Voyage Home" that they do one of their most famous maneuvers with a captured Klingon Bird of Prey — a slingshot around the sun to nab humpback whales from the 20th century. The Enterprise crew pioneered the manuever with the U.S.S. Enterprise (which we also think is an awesome time machine) in the classic first season episode "Tomorrow Is Yesterday." The crew's escapades in 1980s San Francisco include Captain James T. Kirk (William Shatner) mastering the use of "colorful metaphor" swearing, and explaining the behavior of Mr. Spock (Leonard Nimoy) by saying Spock used too much "LDS" a few years ago. Based on the 1895 H.G. Wells novel, this 2002 movie shows Alexander Hartdegen (Guy Pearce) sitting in a complicated device of wheels, levers and light to travel 800,000 years into the future. He planned to test this device to save somebody he loved, but his first flight plunges him into a war he is not prepared to fight. Bill and Ted are in the phone booth during their excellent adventure. Demonstrating how a war can be fought in four dimensions — yes, including time — the Time Displacement Equipment is a central part of "The Terminator" film series. At various moments, different factions in the war between humans and machines use the equipment to send their agents backward or forward in time. The device looks like a big gyroscope, and travelers must be specially coated before entering for it to work properly. The rocket sled is used for time travel in "Timecop." While time travel movies introduce all sorts of paradoxes, the rocket sled in "Timecop" (1994) has an unusual one: The device appears to vanish every time users climb into it and careen toward a wall. But when riders goes back to where they came from, they magically appear in the sled again. This phenomenon has spawned much speculation on the Internet. The time turner device appears in "Harry Potter: The Prisoner of Azkaban." This innocent-looking pendant is used by Hermione Granger (Emma Watson) to gain more time for her studies. After special approval from a professor at the Hogwarts School of Witchcraft and Wizardry, she uses the device to regularly jump back a few hours in time to take extra classes. Hermione keeps the device secret from her friends Harry Potter (Daniel Radcliffe) and Ron Weasley (Rupert Grint) until it comes in handy for a rescue mission. The television show "Lost" included time travel. "Lost" is one of those television shows in which nobody really knows what's going on. But a few seasons in, it becomes clear that the island on which the travelers are stranded has time-travel properties, which are sometimes activated via a frozen wheel. But their attempts to change the past usually succeed only in bringing about the same events via other means. While time travel is illegal in the "Men in Black" universe — there are concerns that criminals could use the technology to their advantage — it ends up playing a key role in the plot of "Men in Black III (2012), which includes extensive references to the Apollo 11 launch of July 16, 1969. The hand-held device can be activated by falling with it to the ground from a height. Sherman (left) and Mr. Peabody at the WABAC machine. This time machine was actually invented by a dog — the super-genius Mr. Peabody — for his pet human boy, Sherman. The duo travel in the time machine together to see important events in history, such as the famous Charge of the Light Brigade during the Crimean War in 1854. The Wayback Machine website on the Internet is an homage to WABAC, which, in turn, was inspired by the popular UNIVAC computers of the 1960s. The time machine in the 2004 movie "Primer" was originally used by the characters to try to make money in the stock market. However, another person discovers the time machine and gets ill from the effects of it, casting doubt on its utility. In DC Comics' "The Flash," the superhero speedster uses his own speed and a cosmic treadmill to travel through time. In perhaps the ultimate inspiration to exercise, this treadmill will take you back in time — but only if you go at superhuman speed. In one famous comic book, Barry Allen uses the device to go to the 25th century to encounter Professor Zoom, a noted villain in the DC Universe.